Yours is the 1359399 th visit. The scientific bureau of the Party for the Animals, also known as the Nicolaas G. Pierson Foundation, is to release a documentary this spring about climate change called "Meat the Truth." The foundation wants this movie to be regarded as a sequel to former US Vice President Al Gore's movie "An Inconvenient Truth." While "An Inconvenient Truth" does explain the problems resulting from global warming, it does not mention the biggest cause – livestock farming. "Meat the Truth" shows clearly that livestock farming for meat and dairy production is a bigger cause of global warming than emissions from all the world's vehicles combined. Appearing in the movie are renowned Dutch actors, writers and politicians, who also share their views on being vegetarian. Scientific evidence from the United Nations Food and Agricultural Organization (FAO) is presented as well, with supporting data about the immense effects of livestock farming on our climate and environment. ■The carbon dioxide emissions of a cow for a year are the same as those of driving a car for 70,000 km. ■A vegetarian driving a Hummer SUV is environmentally friendlier than a meat eater on a bicycle. ■If people in Holland were to eat no meat for one day per week, the amount of carbon reduction would equal the Dutch government's goal for all households for an entire year. ■In South America, about 400 million hectares of soya crops are used as cattle feed. If this were to be used for human consumption, only 25 million hectares would be needed to feed the whole world. Scientists of Vrije University in Amsterdam lent their expertise to the filmmakers in presenting this information. At the end of the movie, the audience is provided with tips on how they can make a difference in addressing climate change. There is already much worldwide interest in this documentary, which is planned for release in both Dutch and English languages. 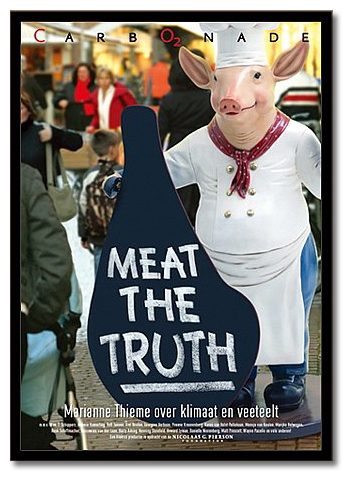 We wish "Meat the Truth" every success. May it be well received as a valuable contribution to our understanding of why vegetarianism must be included as one of the solutions for saving lives on our beautiful planet.